#103 w/Syracuse 415-413 B.C.- Magazine Only! France 1944 pour CC - Resistance ! Syracuse (415/413 BC) covers the land and naval battles as well as the siege of Syracuse during the Peloponnesian War. It appears as the inserted game of VaeVictis #103 "Special Game Edition". Syracuse is a two players game: Athens and allies vs. Syracuse and allies. One game turn covers three months. 1 16 pages rules booklet (14,4x21 cm). Players will be able to build forts and walls, to launch naval operations and to lead land battles. 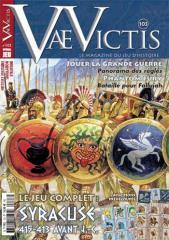 Note: The rules are based on those in Sphacteria, 425 BC, a game that appeared in issue #95 of VaeVictis magazine. They include specifics on siege activities and construction of fortifications and several additional developments.